The Terror Daves Meet for the FIRST time…Rock n’ Shock 2010! A little over a month ago, I was having an email exchange with my co-blogger and friend, David Albaugh. He was disappointed that his plans for this October’s annual “Rock & Shock” horror convention in Massachusetts had fallen apart. Attending a fan convention alone is never as much fun as sharing the experience with a fellow enthusiast, especially if you’re looking for a reliable photographer to capture those rare moments of you interacting with your favorite celebs. I genuinely felt bad for him because I knew that, while fan conventions are abundant here in my centralized Midwest location of Chicago, this was much less the case in his native Rhode Island. This disappointing revelation took place around my 40th birthday (another disappointing revelation) and the wheels in my head began to turn. I called my wife to see if, as a birthday gift, she’d help me purchase a plane ticket to Rhode Island. She quickly agreed and David seemed to accept the idea as well, making what was once deemed an unlikely meeting of the “Daves” become a reality. This, however, could be a mixed blessing. The Internet is a great tool in connecting with people on a superficial level if not necessarily a meaningful one. I make this statement without judgment but, the fact of the matter is, some online relationships are just plain better off staying there! And, in terms of online friendships, this one was a relatively new one at that. I had just “met” him scarcely a year ago on the Svengoolie YAHOO Group. The moderator of this group (who goes by the name of Blue Cat) accepted an email from a member while stating that this “would be the last of its kind she’d allow.” A man from Rhode Island was requesting that a Chicago fan send him new episodes of Sven to trade with older ones he had managed to collect over the years. I’d been a member of this group for years and had seen dozens of these type of requests pile up in my inbox. I completely understood Blue Cat’s position and had always ignored these types of messages before. For reasons I still can’t say, I decided to write Mr. Albaugh a reply stating that, as long he supplied discs, he was welcome to anything I had and that I would tape new shows for him as well . My act of “charity” ended up being more like hitting the jackpot! We exchanged lists and he ended up having many more shows than I did. Having missed the first seven years of Svengoolie’s return to television, I had just found someone who could actually help me fill in those gaps. He willingly agreed to send and exchange all requested shows for some of mine, along with the promise that I send him all the new ones that aired as well. Soon we discovered Michigan horror host, Wolfman Mac, and this led to an email exchange between us in January where I wrote – “It’s so neat to see a totally new host from a different state! Wouldn’t it be cool if we could see the work of other hosts from around the country?” David took this request and ran with it. We now have an enormous sampling of hosts who have, and shall continue, to grace this very blog site. There was just one major drawback…our geography! Rhode Island isn’t just another state, it’s a whole different region. Perhaps this distance was contributing to our site’s success and I was now in danger of violating it. As the plane touched down in Providence, I had a nervous feeling that this was going to be a disaster. I did feel a sense of awkwardness when we finally did meet but we soon (as David would later say) “clicked.” We intended to check out the Roger Williams Park Zoo to enjoy their Halloween lights display. Mother nature, however, had other plans. Tropical storms out in the Atlantic created intense winds for the tiny coastal state. I joked that I was used to it having arrived from Chicago but, in truth, it had been a long time since I had experienced gusts of that magnitude. Regardless, this wasn’t an evening to be spent outdoors and we ditched the zoo plans heading to his home instead. 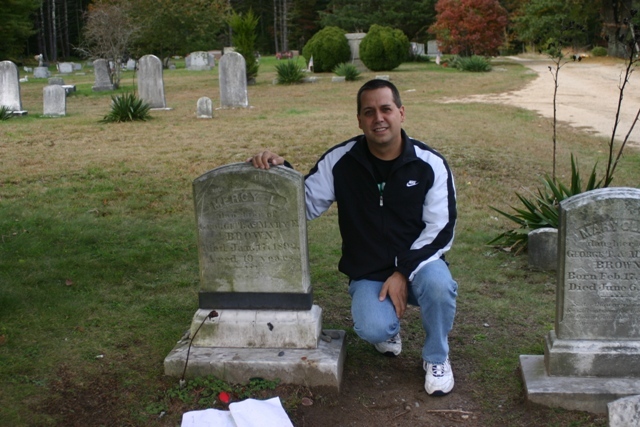 While on the way, David stopped at the Chestnut Hill Cemetery in Exeter to show me the resting place of Mercy Brown. 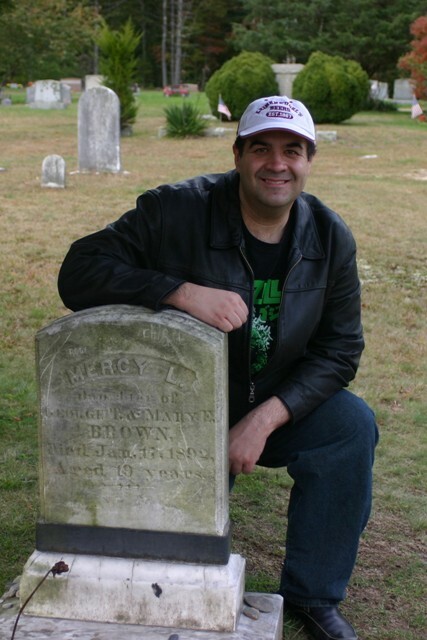 Mercy Brown was believed to be a vampire and represents the first time an undead ritual was performed on American soil. While this was more likely a case of Tuberculosis, coupled with local hysteria, it has inspired many ghoulish tales and remains one of the most prominent urban mythologies from David’s home state of Rhode Island. It was a horror host that had brought us together as friends and another that helped break the ice. After spending the next few hours laughing at Nevada’s Zomboo it was as if we’d known each other for years. The awkwardness soon evaporated and the stage was set for an amazing weekend. The next day (Saturday) we drove to Massachusetts to attend the “Rock & Shock” convention. Last March I believed nothing could beat the 2010 Indianapolis Horrorhound Convention and those who read my earlier blogs depicting the event can easily see why. As you will read in coming posts, however, “Rock & Shock” came pretty damn close! Amazing celebrity meetings along with a chance to, once again, commune with the great hostess – Penny Dreadful (featured in an earlier Horror Host Spotlight) has me already marking my 2011 calender to return next year. On Sunday we would venture into the town of Salem, Massachusetts and enjoy the best this historical town had to offer. The number one attraction (and highlight of the day) was seeing “Count Orlok’s Nightmare Gallery” and meeting David’s close friend, James (Jamie) Lurgio. This absolutely phenomenal place was covered by David in an earlier blog though, with all due respect, words can’t really do it justice. Any fan of monsters NEEDS to go there, end of story! I understood exactly what James was saying. I had envisioned doing a horror based website for years but never seemed to be able to get the ball actually rolling until sharing my vision with a like-minded individual who readily agreed to join forces. If there’s one thing I learned from “Count Orlok’s Nightmare Gallery” and “Terror from Beyond the Daves,” its that hanging around with the best people ultimately brings out the best in YOU. And David Albaugh is definitely one of the absolute BEST. This entry was posted in Convention & Expos and tagged Count Orlok's Nightmare Gallery, MERCY BROWN, New England Vampire, ROCK N SHOCK, Svengoolie, Terror Daves. Bookmark the permalink. ← The Mind of Kenosha Horror Host Dr. Destruction! I’m so glad you guys had an amazing weekend! Life is crazy how it leads you to the right people at the right times. I can’t wait for the details of the convention! See now Dave A., aren’t you happy I couldn’t make it with you last weekend? 🙂 I’m so glad things went well for the both of you. Sounds like next year will be a blast too.